Our clients ,Matt and Beth, dreamed of having their wedding celebrations in the grounds of Beth’s family home inside a Traditional Marquee with the hope of having the marquee sides open if the unpredictable British weather would allow. The marquee was to house areas for the wedding breakfast, blessing, bar, stage and dance floor. The caterers would also need space to cook and prepare food for their guests. The marquee was to have flowers suspended over the dining area between the king poles and festoon and fairy lights were required in the roof of the marquee. We worked closely with our clients to achieve their dream within a budget of 10K! To ensure Matt and Beths dream was achieved we installed a 12m x 30m (4 King Pole) Petal Edged Traditional Marquee which would house all the relevant sections required. For the wedding breakfast round tables were used to seat 140 guests, the dance floor was used to seat guests for the blessing and a small stage for Matt and Beth to be slightly elevated so their guests could see them. This style of marquee can have its walls removed to allow the outside in. To achieve the flowers suspended over the diners wooden ladders were hung between the king poles. Fairy lights and festoon lights were installed within the roof canopy, Once the blessing was finished reception drinks were held outside while the chairs were placed around the tables. The caterers had their own 9m x 9m marquee joined to the main marquee to prepare food with all their power requirements delivered by our generators. Floor plan showing the design layout, after the blessing the chairs were replaced round the tables for the wedding breakfast leaving the dance floor free for the evening. Marquee walls removed for wedding breakfast creating fantastic views of the grounds. The marquee walls were replaced for the evenings dancing and entertainment. 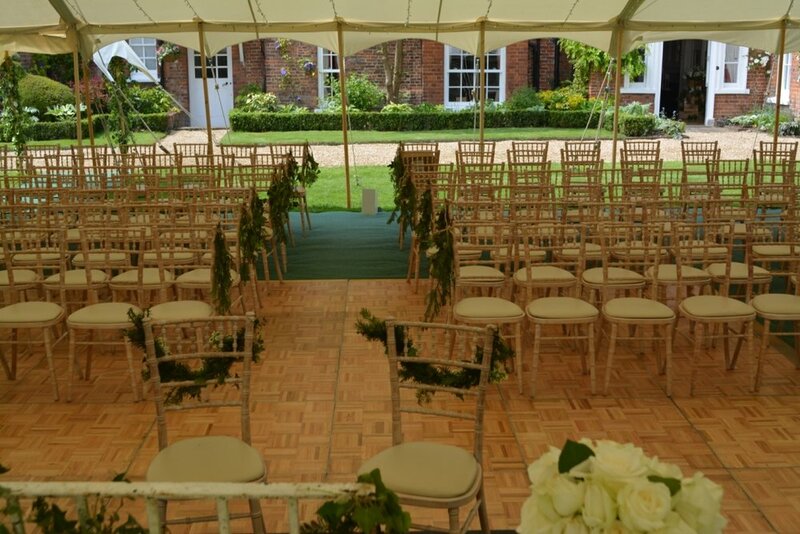 The blessing area was created by using the dance floor space during the day time, then clearing away the chairs while reception drinks were taken in the garden. 12m x 30m Traditional Marquee within the family grounds with the marquee walls removed. The Marquee looks fantastic from the outside for when evening guests arrive. Our Traditional Bar is a fantastic addition to the celebrations, other styles of Bar are available and have been designed to compliment our Traditional Marquees.